MITZPE RAMON, ISRAEL–It was a little warmer today in Makhtesh Gadol, but the sun was still obscured by the dust blown across the southern Mediterranean from the Sahara Desert. I may have an innate tolerance for dust from my childhood in the Mojave Desert, but this particular dust triggers a kind of hay fever for me. Maybe it is because Saharan dust is rumored to have a significant fraction of insect parts! The top image is from the Mt. Avnon overview of Makhtesh Gadol (looking south along the west wall). 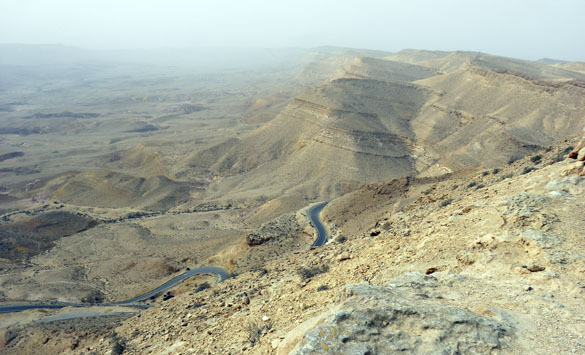 The road below was built by the British in the early 1940s in an attempt to find and exploit oil from the makhtesh structure. The road is very well built and has survived with relatively little repair beyond paving it. It is astonishingly narrow, though, especially when you meet large mining trucks and tour buses on it. The trip down the most challenging portion was immortalized in a 2011 movie by filmaker Will Cary. Note the blue skies that summer. Melissa and I located a series of outcrops in the Matmor Formation (Middle Jurassic) exposing “subunit 51”, which has a diverse crinoid-brachiopod community preserved in it. 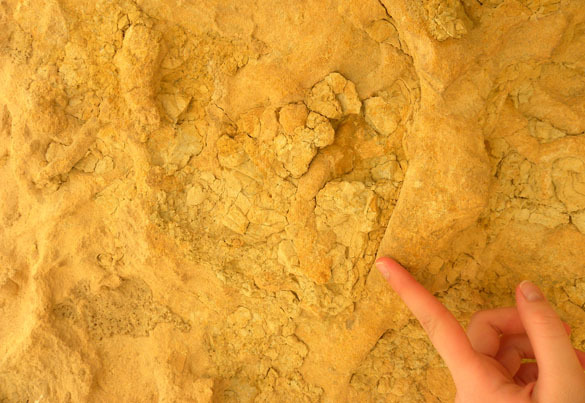 This assemblage has a very patchy distribution, so we want to see as many exposures of it we can to make certain we’ve collected a representaive fossil fauna. Ordinarily our outcrops of this marly subunit look like the one above. The yellow-brown color is distinctive, so it is relatively easy to find throughout the area. There is no hope, though, of seeing sedimentary and paleontological structures in such a loose sediment — it simply erodes too quickly. We found one site, though, where subunit 51 is preserved in a cliff (above), which prevented it from disintegrating in the usual manner. From Melissa’s hat on down is the top portion of this critical marl. 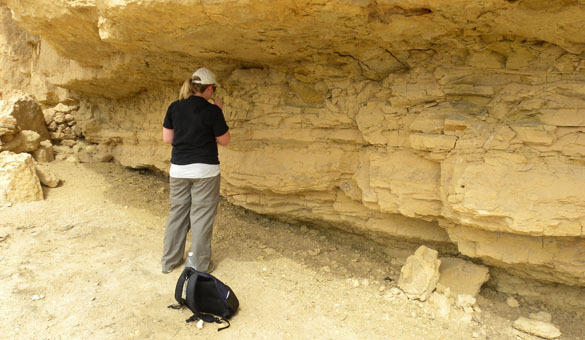 We could see no structures in the featureless marl itself, but on the base of the limestone above there are infillings of a trace fossil known as Thalassinoides. These were probably created by burrowing crustaceans (likely shrimp) that dug down into the very top of our subunit 51 mud. 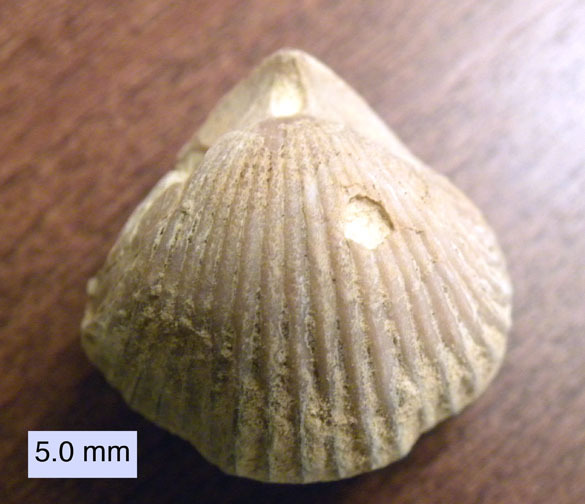 Our favorite fossil find of the day is this little rhynchonellid brachiopod shown below (likely Burmirhynchia) with a round hole in its dorsal valve. It is tempting to say this is a predatory borehole — the work of a carnivore of some kind — but we can’t tell for certain. It is not beveled on its periphery, so we can’t distinguish it from just a hole punched after death through the vicissitudes of burial, preservation or exposure. Still, it is fun to think of it as a fossil predatory interaction. We had one that looked like this, with a photo of you standing by it. I don’t think it was this one, though. Glad this all brings back good memories! It does for me too. We had fun, and were very productive.